Borderway Agri Expo – A Festival of Farming! The 10th Borderway Agri Expo, held on Friday 28th October, was a true festival of livestock farming attracting over 13,000 visitors and over 950 head of livestock. From the outset the 2016 Borderway Agri-Expo event was also set to be a celebration of every side of agriculture, as befits a milestone event, which has, over the years, gone from strength to strength. Representatives of all the major British Livestock Sheep and Cattle Breeds were in attendance, with their leading industry spokesmen and women, and livestock representing the best of their breeds. At the top of the winners list, it was a day for the ladies as both Supreme and Reserve champions were heifers. The Overall Borderway Agri-Expo 2016 Champion was J-Lo, a Limousin X heifer from Gareth Corrie, Johnny Neal and Charles Bever, who together make up JCB Commercials based at Newtownards, Co Down, N.Ireland. Reserve Champion was 17 month old heifer Honey- Dime, a Charolais X Limousin, owned by Wilson Peters of Cuilt Farm House, Monzie, Perthshire bred by Carwood of Elgin. The young handlers in the cattle classes again drew great interest with the girls winning both the steer and heifer sections. 20 year old Georgina Laws from Leyburn lifted the steer handlers title and 17 year old Amy Wilson from Penrith secured the heifer handlers award. Beef Shorthorn Champion was John Elliot of Roxburgh Mains, Kelso with the heifer Elliot Echo 338. The reserve ticket was won by Thomson, Roddick & Laurie, Lockerbie, Dumfriesshire with the young bull Shawhill Kenco. Aberdeen Angus Champion was Donald Rankin’s Weeton Princess Chartreuse, of Kilmaluag House of Duntulm, Isle of Skye. Morpheus Rosebud, from Owen Tunney, Cuddington, Northwich, Cheshire, was reserve champion. Hereford Overall Champion was Fardre 1 Ms Gwen, a heifer from J H Morgan, from Abergelly, with Reserve position going to Romany 1 Lucy-12, a heifer from JRB Wilson and Sons, of Cowbog Farm Kelso. British Blue Overall Champion was Dylan Townend’s heifer Clifftown Lucky Star, from Quarry Farm Broughton, Nr Malton, N Yorks, with Reserve, Ian McGarva’s young bull Abington Lionel from Abington, Biggar, Lanarkshire. Simmental Champion Overall Champion was Denizes Hamish 16 a young bull shown by MA Barlow, Preston, Lancashire. Standing in reserve position was another young bull Storersmith Ghost Rider 15 from Mr & Mrs R & L Storer Smith, Uttoxeter, Staffs. Baby Beef Champion was Queen Bee from Bowen and Bowen, a six month old Limousin cross heifer, and reserve champion, Ashley Bothwell’s Cheeky Charlie, a Charolais cross. In the sheep classes, overall Champion sheep went to C R Graham & Sons of Carruthers Farm, Lockerbie with a pair of North Country Cheviot Lambs. Reserve Champions were two Blackface Lambs, from H F Hamilton of Glenmanna, Thornhill, Dumfries. 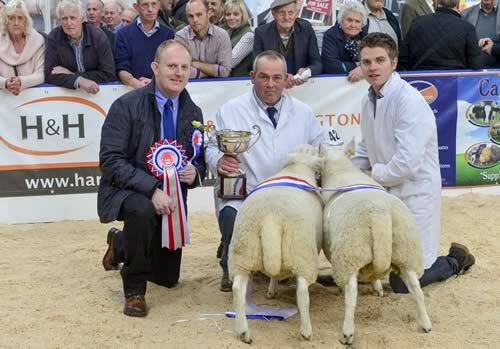 In a class of fifteen entries, the best pair of Mule Gimmer Lambs, judged by William Wallace of Gapshields Brampton, was awarded to J & J Wilson, Dunning, Settle who received the NEMSA Perpetual Trophy. Although much of the focus of Borderway Agri- Expo is on judging the best sheep and cattle that Britain can produce this is also a very important industry event. With over 165 trade stands, there were representatives from the many organisations that keep farming going and drive the industry forward – from the breed society stands to science, technology, vet services, products, accounting and legal, leisure, education training, machinery and mechanics. Winner of the 2016 breed society stand was the British Charolais Cattle Society, indoor trade stand was Nickerson Seeds and outdoor trade stand was awarded to W M Plant (Carlisle). Throughout the day many of those attending and exhibiting were keen to highlight that with the decline of big national shows, Borderway Agri Expo has naturally become a key industry event for the UK as a whole. There may be uncertainty of the future in many areas, one thing is certain, and that is that the future for Borderway Agri- Expo is very positive as it heads into its second decade – Date for next year Friday 3rd November 2017.